What better example than the World Cup is there of the fact that individual people are irrelevant while impersonal structures are invariant? The World Cup is like the Overlook Hotel: the identities of individual meat puppets might change, but the structure continues endlessly. England's defeat in a penalty shoot-out - for the fifth time in a major tournament - is one example of a trend that keeps repeating itself. Another, bigger, pattern - South American teams do not usually win in Europe - was confirmed last night when Brazil went out to France. (There has only been one exception to this rule: when Brazil won in Sweden in 1958). Conversely, European teams have never succeeded in South America. There have only been three new winners of the World Cup since 1958 (England, Argentina and France), and they were all the host nations the first time that they won. How then are to account for the persistence of these patterns? First of all, we must note that the role of belief and desire in sporting success is clearly far more crucial than we ordinarily assume. For instance, the reason that new World Cup winners are host nations is almost certainly that playing at home allows teams to cross a kind of belief threshold where success becomes thinkable. Last week, Leonardo observed that England's problem was precisely that its team does not believe that it can succeed. Brazil, Leonardo said, take to the field assuming that they are the best. 'That's because you are,' Gary Lineker interjected, completely missing the point, which was that belief is a precondition for success, an existential act of faith, not an empirical representation of a fact. In the case of the successful nations, the assumption of superiority functions as a kind of hex on less confident teams. In the second round match between Brazil and Ghana, for example, in which the Brazil team performed like bored, highly paid actors only willing to read the few pre-scripted lines essential to the plot before returning to their trailer, it was clear that the Ghana side was fatally hamstrung by its inability to believe that it could win. Powerful and skillful in midfield, the Ghana team disintegrated whenever they had a serious opportunity on goal, hopelessly miscuing their shots. It was as if the Brazil goal was protected by a psychic forcefield - which of course it was. The fact that the Ghana players could not believe that they could score meant that they were unable to. England's repeated failure in penalty shoot-outs is not down to bad fortune, as the English media, with its empiricist presuppositions, insists. To lose once might be an accident, but to lose five times demands a psychoanalytic explanation. Some clues as to the nature of the libidinal disorder which afflicts the England side were provided when Rooney was sent off yesterday. From being disjointed and tentative, England suddenly looked purposive and effective. That was because Rooney's dismissal gave England the opportunity to achieve what it is most comfortable and familiar with, a heroic defeat. 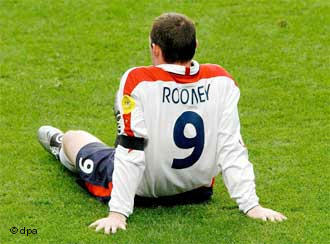 England players are so accustomed to failure that they would find success traumatic and unimaginable, so it is as if, time after time, the team contrives to lose one of its key players - Rooney yesterday, Beckham in 1998 - in order to set up the conditions for the desired 'heroic defeat'. The fact that England once again lost at penalties has been treated by the media here as yet another slight by cruel Fate. ('Who'd have thought that Lampard and Gerrard would have missed?' screeched Jonathan Pearce in the Mirror this morning: well, Jonathan, only someone who had watched the tournament, I suppose.) But the comparison with the Germans, who despatched all their penalties against Argentina on Friday with clinical ruthlessness, immediately gives the lie to the idea that 'penalties are a lottery'. The German team succeeds in penalty shoot-outs for the same reason that it succeeds in World Cups in general play: its capacity to avoid 'subjectivating' stressful situations. What makes penalty shoot-outs tortuous is, as is obvious, the subjective situation; the answer, then, is to do what England players seem to find impossible, and to retain focus on the objective reality that scoring a penalty kick is not difficult for a professional footballer, and that you should expect to score, not to miss. It is precisely the Germans' capacity for this kind of detachment has infuriated and frustrated English supporters over the years. As Owen observed the other day, 'with Germany there is no mythology'. Defeat has never been interiorized, ontologized and narrativized. Not so with England: when it comes to penalties, the fact that England have lost in so many previous contests is part of a self-sulfilling circuit, the sheer fact of repetition itself functioning as a means by which the past can repeat itself. What makes Italy so compelling and sympathetic a side to watch is that their self-belief is so precarious. Unlike their English counterparts, the Italian team do not find success unthinkable. But they are continually haunted by the spectre of failure, which makes watching them a real existential drama. When we watched the second round game between Italy and Australia, Savanorola observed that, after the dismissal of Materazzi, Italy had gone into 'pre-defeat mode'; they could already see the humiliating headlines from the next day's newspapers, an anticipation that, naturally, threatened to bring about the very catastrophe it feared - an exemplary case of a hyperstitional circuit, a future bleeding back. As it turned out, Italy were able to avoid that particular future, to step out of the fatalistic trap which seemed to be forming around them. England, however, never seem able to escape these fatalistic nets. That is partly because Defeat has been transcendentalized in English culture, transformed into a basic presupposition of experience. The problem is that a failure of belief - 'We cannot win' - has been transformed into a desire for failure - 'it is better not to win'. This kind of libidinal switch was what Nietzsche famously described in his analysis of slave morality. Unable to act, the slave eventually comes to think that it is better not to act, that those who are successful are Evil oppressors, that it is the weak and the destroyed who are the Chosen. It is important to note that this structure of belief can in no way be reduced to an aggregation of the psychology of individual players. Take someone like Frank Lampard, a deadly agent of Inevitable Success when playing for Chelsea's billionaires, but a hapless carthorse when lining up for England. Throughout the tournament, Lampard had the bemused air of a superhero suddenly and inexplicably stripped of all his powers. Inserted into the Transcendental Defeatist belief structure of the England team, he becomes a different player.